Participants will be provided 12 problems which is to be solved using either of the language - C, C++, JAVA, C# etc. 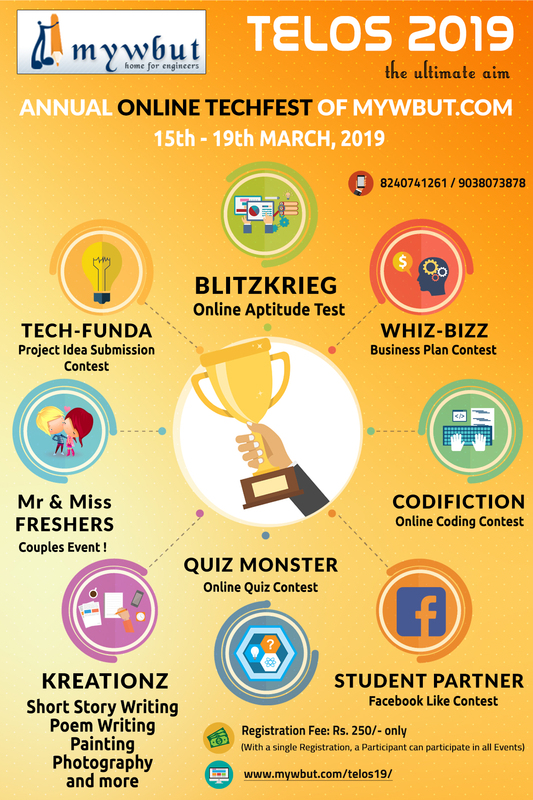 Problems will be available from 16th March, 2019 at 11:00 AM and Participant must submit thier solutions within 17th March, 2019 at 11:00 AM. i.e Participants need to solve the problem within 24 hours. Participants are required to create an account in HackerRank website with the Username of HackerRank profile as TELOS 2019 Registration ID (for Example, COD_TLS000001). Any case of code plagiarism will result in disqualification of the users from the contest. HackerRank has a fairly good plagiarism detector that works at the opcode level. Participants can code directly on HackerRank interface. HackerRank support 20 major languages. Participants can have a look at the environment in which HackerRank run your code. Participants can try out sample code given in Solve Me First to get familiar with I/O. HackerRank and MYWBUT admins decision will be final. Each submission for each problem will be scored, based on number of testcases it passes. The total score of any participant is the sum of their maximum scores of each of the attempted problems. Participants will be ranked according to their scores. Cumulative time taken to solve the challenge is used as a tie-breaker.